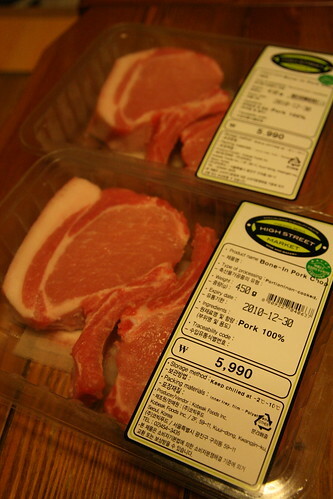 A beautiful sight on Christmas Eve, skin-on bone-in pork chops, courtesy of High Street Market. I had a few issues getting my hands on them, a slight misunderstanding and a delay of a day, but for a store that has only been open a week, it's forgivable. Plus the owner kept me up to date with phone calls, apologies and even threw in a free ribeye steak for my troubles. It's good to know that there are still small shops out there that want to take care of their customers and I know that I'll be buying more meat from High Street Market because of theway they've treated me (plus their beef is cheaper than the local supermarket). Completely agree with your sentiments about the shopkeeper doing his best to make his customers come back again and again. High Street Market do this very well. In addition to a genuinely cosmopolitan and friendly vibe about the place they have great products, including freshly baked bread (baked on site, not just delivered). Even better still my fiancée and I won a case (12, not 6 bottles) of wine a week before Christmas. HSM is my new favourite shop in Seoul! Oh, never mind... I just read down the page a little.